This hotel is a destination for those who appreciate the best in life. The best views, the best climate, and the best accommodations. The 7 Villas and 1 suite are spacious and accommodating, and the newly renovated restaurant and bar are exotic and moving, but it is the dramatic and awe-inspiring ocean views that will leave you speechless! Each villa is fully equipped with kitchens, modern amenities, and are tastefully appointed with comfortable furnishings. Villa 1 is composed of 2 spacious bedrooms, each with king size beds, a living room and kitchen, and 1 large bathroom. Villa 2 is made up of 2 very roomy bedrooms, each with king beds, and 2 bathrooms, a kitchen and a nice living room. This unit is very spacious and airy, and it is nice and private. Like most of the villas, there is a futon in the living room. Villa 3 has breathtaking forever views of the Pacific Ocean, one large bedroom, one bathroom, and beautiful tropical breezes. The kitchen and the living room are well appointed. Villa 4 offers the convenience of parking beside the villa. There are 2 bedrooms with queen beds, and one bathroom. This villa has nice features, including a nice living room and a great kitchen. Villa 5 is a spacious and welcoming, 1 bedroom villa with a king bed. It has villa side parking and nice living spaces in the living room and fully functional kitchen.. Fully accessible, Villa 6 is bright and spacious, and it offers a large living room, large bedroom with king bed, and a large bathroom. The kitchen is fully equipped. Villa 7 is a remodelled 2 bedroom unit that has a generous living room with futon, 2 bedrooms with king beds, and nice views. It also has a modern kitchen. Finally, suite 8 is a 1 bedroom unit with nice bathroom. This unit has the capability of opening up to Villa 1 to create a 3 bedroom 2 bathroom unit if necessary. The pool side restaurant and bar were completely renovated and reappointed in 2018, and is known to be one of the most elegant and inviting spaces in the area. The stunning and lush jungle surroundings make you feel like you are living in harmony with the abundant wildlife and monkeys, as you float above the Pacific and enjoy the tranquil surroundings in this incomparable 2 acre resort style retreat. Perched at approx 900 feet of elevation, the white water views of the warm Pacific Ocean stretch from the Osa Peninsula to the coast line of Manuel Antonio. 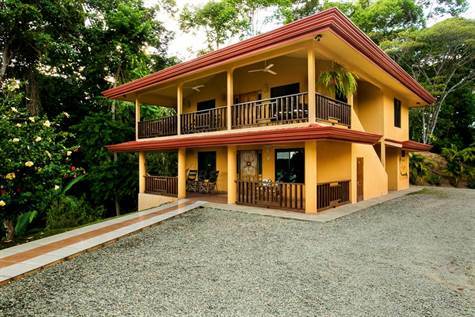 Designed for those who are looking to experience all of what Costa Rica has to offer, without sacrificing luxury and comfort, this property is the absolute best choice for the discerning buyer. The many updates include new roofs in 2015, pool renovations in 2015, solar installation in 2016/2017, which offsets the operation costs and helps to protect the environment, and a complete kitchen, restaurant and bar renovations in 2017/2018.